McALLEN — A winter wonderland glistened over the Veterans Memorial Stadium Saturday night, and it was 83 degrees. Children were fascinated by the artificial snow that floated around, catching the soap bubbles in their hair and shoulders as evidence to their parents that they were playing with the machine. Nine-year-old Rebeka Perez has attended the McAllen Holiday Parade for as long as she can remember, and says that the snow is her favorite part every year. Participants move through McAllen Veterans Memorial Stadium during the McAllen Holiday Parade on Saturday, Dec 1, 2018, in McAllen. 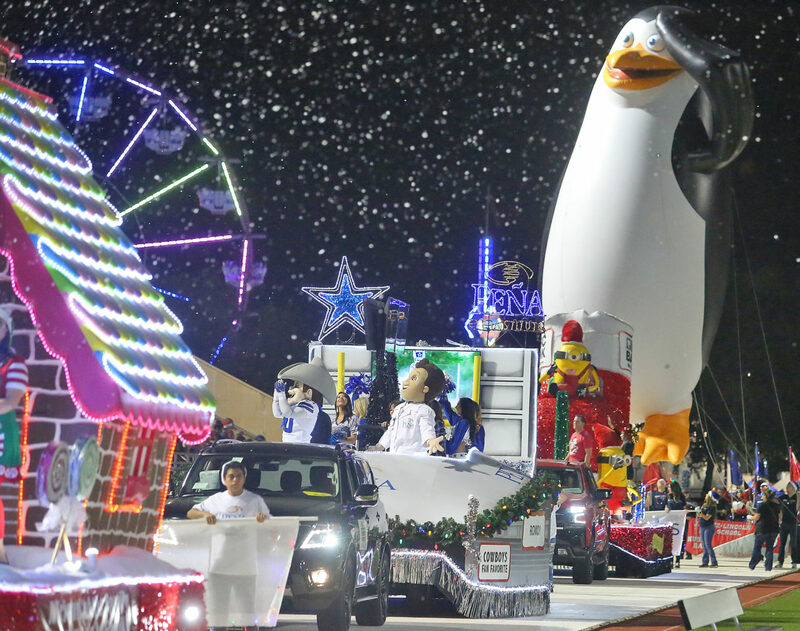 Celebrating its fifth year, the parade carried the theme of “Christmas Around the World.” The event featured 55 illuminated floats, 39 inflatable character balloons and a celebrity lineup, including Anthony Gonzalez, voice of Miguel from the animated film, “Coco,” Telemundo stars, Carmen Aub and Ivan Arana, and for the third year in a row, former and current Dallas Cowboy players, Jaylon and Rod Smith, Tony Hill and Jay Novacek, Rowdy the mascot and cheerleaders. It is Gonzalez’s first time visiting South Texas and he says that being in an area concentrated with Hispanic culture is exciting. 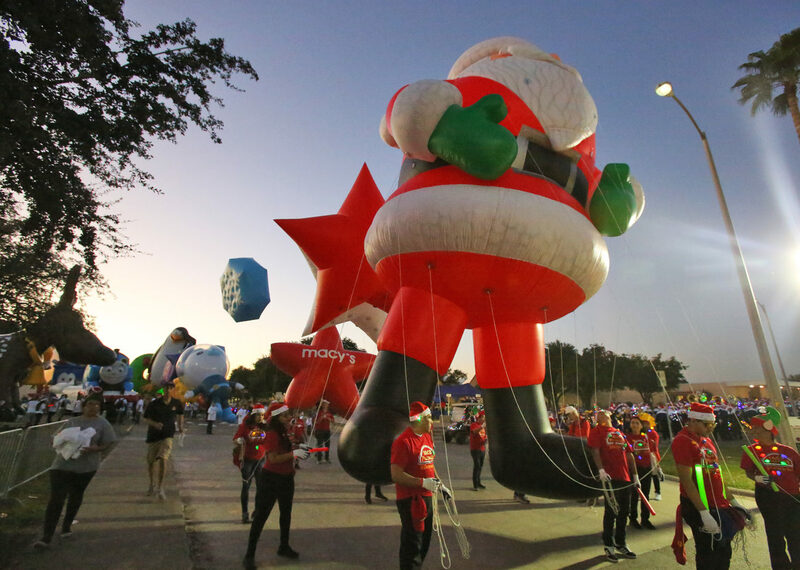 Following the theme of the night, floats included recognizable monuments from around the world, inviting a variety of cultures into McAllen’s holiday spectacular. Mayor Jim Darling waved alongside an enlarged shimmering gold chinese dragon, reindeer were sliding off of a snowy Eiffel Tower, and commissioner of district 2, Joaquin “J.J” Zamora stood alongside his family on a float with three colorful hot air balloons — a nod at the novel, “Around the World in Eighty Days” by French writer Jules Verne. Zamora said that he wanted his float to portray McAllen’s openness to all cultures and of different traditions during this time of year. 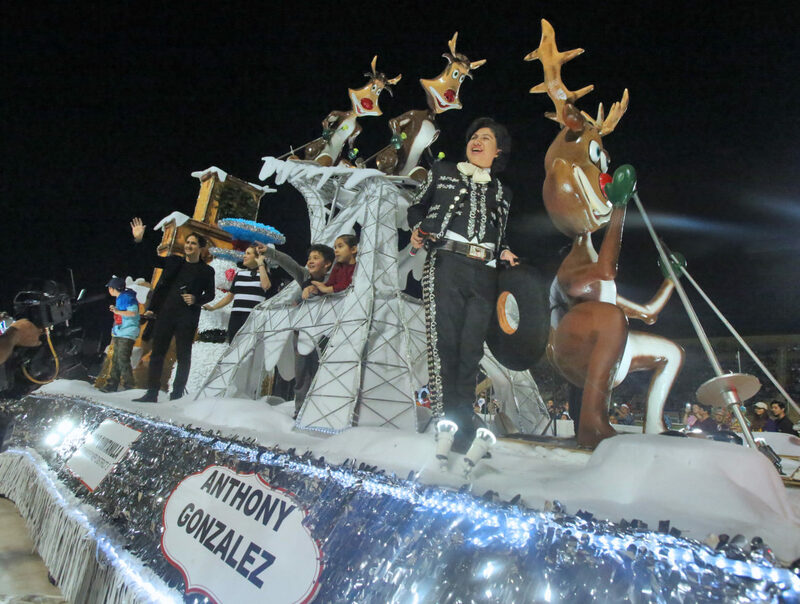 Anthony Gonzalez, star of the movie “Coco”, right, address the crowd during the McAllen Holiday Parade at McAllen Veterans Memorial Stadium on Saturday, Dec 1, 2018, in McAllen. Other holiday-themed floats included a gigantic purple octopus handing out presents, the Great Sphinx of Giza with red holiday bows at its hands, and a huge glimmering orange, representing the Texas Citrus Fiesta. Poised on the Texas Citrus Fiesta float were five princesses, each representing different kinds of citrus fruit. Emma Lozano, 7, princess of lime blossoms, says that she loves seeing the crowds waving back at her. This was Megan Molinaro’s second year attending the parade, but instead of watching the floats pass with her her daughter, Braiden Holliman by her side, she watched Braiden perform with the Perez Elementary choir group. Molinaro says that the annual parade contributes to her pride for the Valley. “I think it’s fantastic,” said Molinato, who’s daughter is in fifth grade. “It is such a sweet opportunity for the students to sing, those who are brave and bold enough to do so. I like to call the city of McAllen a ‘little big town’, meaning that we have a lot of big things in our little town, one being this parade. Guests were welcome to enjoy Christmas at the Park held at the McAllen Municipal Park before and during the parade, and a group from Capable Kids, a nonprofit organization that works with children with disabilities in the community, had the opportunity to meet with the celebrity line-up that morning. At 11:30 a.m., at the McAllen Convention Center, Nathanial Salas, 9, was one of the children in the crowd, eager to meet the stars. He was specifically anticipating meeting Tony Hill, Dallas Cowboys former wide receiver.